1933 Plymouth Hemi Rat Rod project Photo Picture Classic Cars for sale & Classifieds - Buy Sell Classic Car & Classic Truck Classifieds. 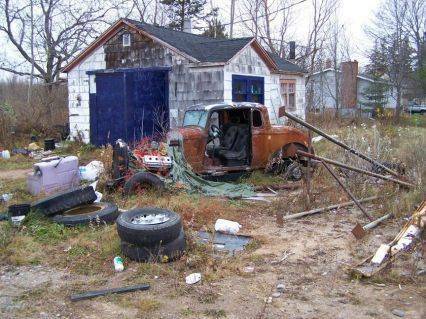 Greg sent us this great Rusty Ride story and Pictures, of a 33' Plymouth in the Annapolis Valley, Nova Scotia. Greg said, "the radiator shell threw me off the make, but after a little research I found out that it is in fact the 33 Plymouth that a friend of mine owned back in the mid seventies. The motor, then and presumably now, is a 392 Hemi. Nobody was interested in talking to me about it when I was there so it's probably going to rot into the ground!" i clean yards and do it almost free of charge ! 33&34 Mopars are my pic of best lookin street rods.The coupes are perfect to me as they looked like a mild chop from the factory.This one is stock top.Two wheel base sizes were made in 1934. Looks like my dads backyard LOL!! VERY COOL!!! I think i'm going to puke!!!! The engine is probably worth more then the combind total of the car and building. Call the cops. Thats a crime. cool!! some body save her!! 58 chevy tail lights on her? the engine in the 33 is a 241 red ram out of a 54 dodge royal. i used to own it and was the last to drive it.ijunked the 54 at least 15 years ago the motor ran pretty good had lots of power. What a crying shame....someone rescue her. Looks like a DeSoto engine. Chrysler and Dodge had the lettering stamped into the valve cover. DeSoto had it on the apark plug wiriing cover. As far as Rat Rod material, that's cooler that a 392. Hi! wear about in annapolis valley,I have a friend who live not to far from there, he may check it out, and convince the owner to sell? ?